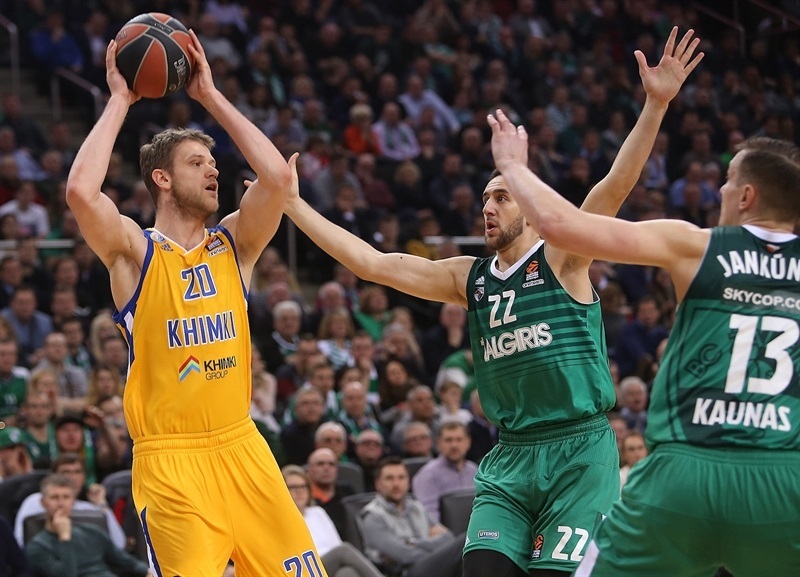 A mammoth second quarter allowed Khimki Moscow Region to claim a vital 74-84 road win over Zalgiris Kaunas, silencing another vociferous sell-out crowd at Zalgirio Arena as the teams move level with 13-9 records. 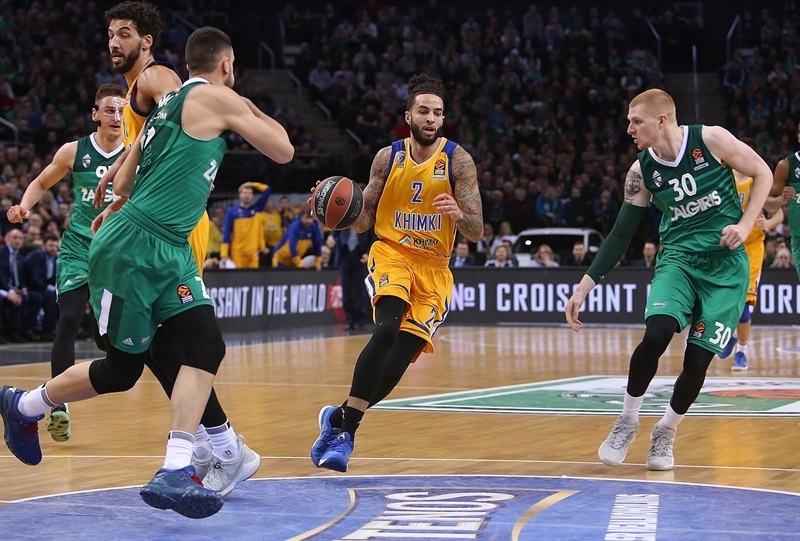 The home team started fast and led by 14 points early in the second quarter, but Alexey Shved and Tyler Honeycutt sparked a spectacular 1-20 surge to completely turn around both the game and the atmosphere inside the arena. 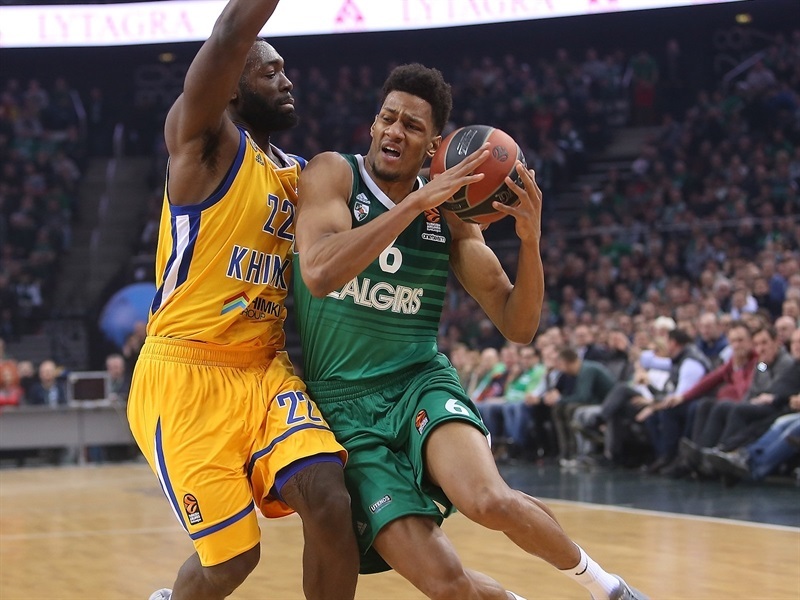 Zalgiris couldn't get its offense moving in the second half, and Khimki held on to claim head-to-head advantage between the teams as well as ending Zalgiris's seven-game home winning streak. Shved was the joint-leading scorer with 20 points, 16 of which came in the first half, while Anthony Gill also netted 20 and the excellent Honeycutt posted 17 points, 4 rebounds, 3 assists, 4 steals and 2 blocked shots. 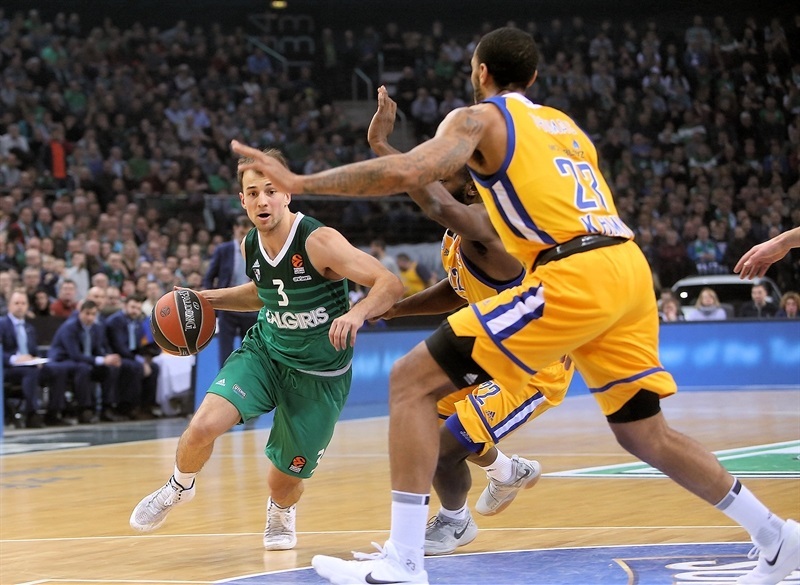 Brandon Davies led Zalgiris with 15 points, while Kevin Pangos scored 12 of his 13 in the opening half. Axel Toupane also scored 13 and Paulius Jankunas added 11. 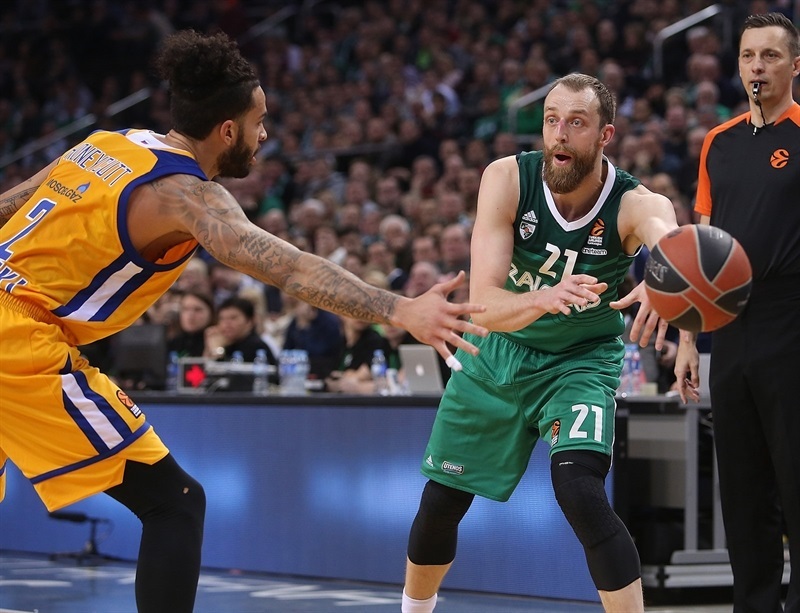 The lead swapped hands regularly in the early stages, with neither team ahead by more than 2 points until Zalgiris produced an 8-0 surge with three-pointers from Jankunas and Pangos to take a 17-10 lead. 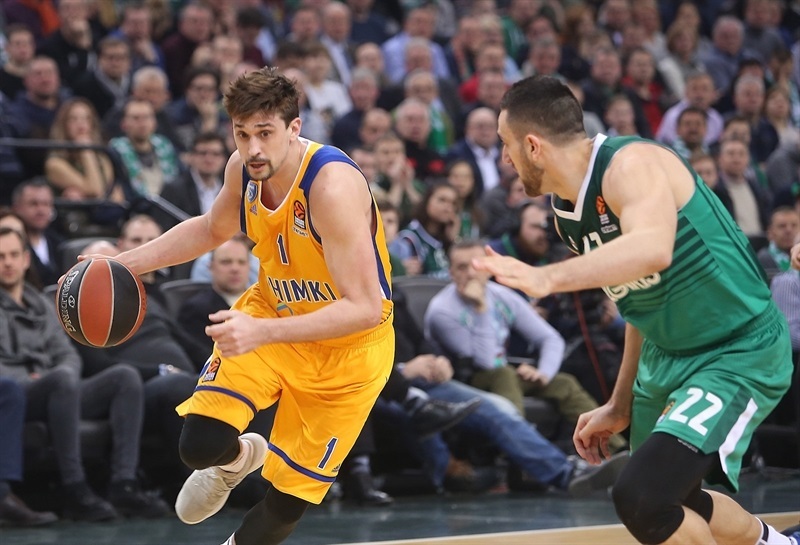 Another Pangos triple took the advantage into double figures, as Khimki was held without a field goal for more than 5 minutes. 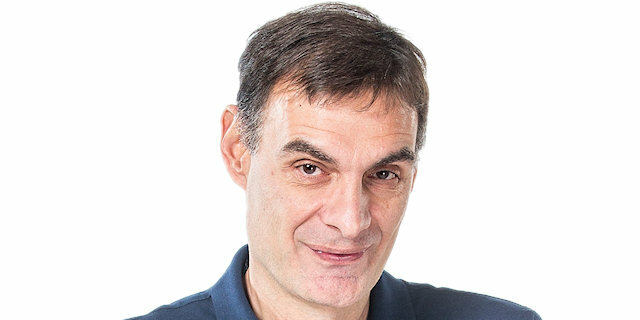 Pangos made 4 free throws after a technical foul on Khimki coach Georgios Bartzokas before Malcolm Thomas answered for the visitors to make it 26-15 after 10 minutes. 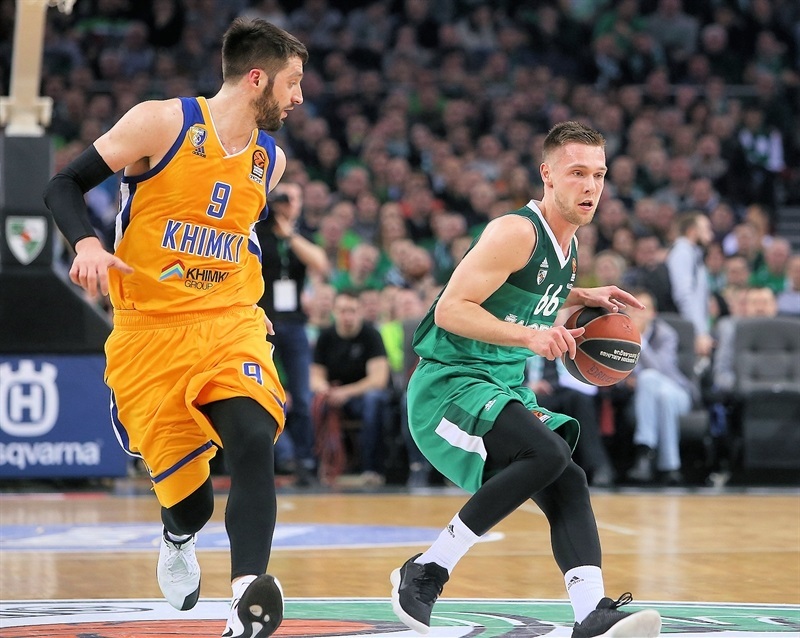 Paulius Valinskas started the second quarter with a triple for Zalgiris before Khimki answered with a Marko Todorovic tip-in and Shved free-throws. A dunk from Davies and a Toupane reverse layup kept Zalgiris moving, and it was 37-23 after a Valinskas floater and free throws from Aaron White. Andrey Zubkov's lay-up and Honeycutt's triple narrowed the gap, before Honeycutt made both from the foul line, Shved dunked and then added a triple to make it 38-35. 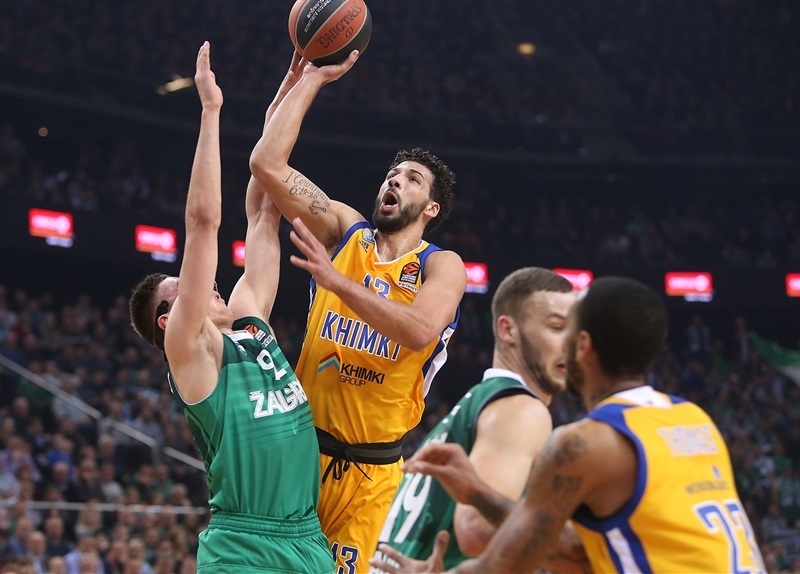 Honeycutt's block on Pangos further frustrated Zalgiris and Todorovic scored from close range before Shved nailed another pair of triples, completing a 1-20 surge and giving Khimki the lead. 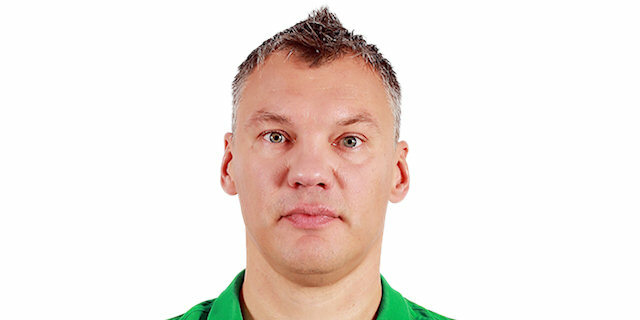 Edgaras Ulanovas ended Zalgiris's barren run after more than 5 minutes without a field goal, and free throws from Vasilije Micic and Davies made it 44-43 at the break. 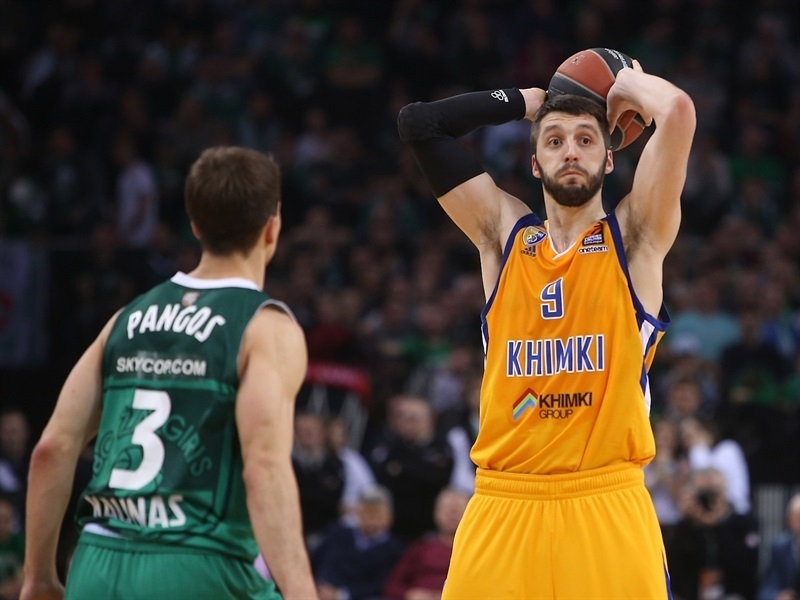 Khimki retook the lead early in the second half through close-range strikes from James Anderson and Gill, and free throws from Thomas made it a 0-6 run. Toupane eventually started Zalgiris's second half scoring from the foul line but Gill responded with a triple, before a trio of two-pointers in quick succession from Jankunas got the hosts back on level terms at 52-52. 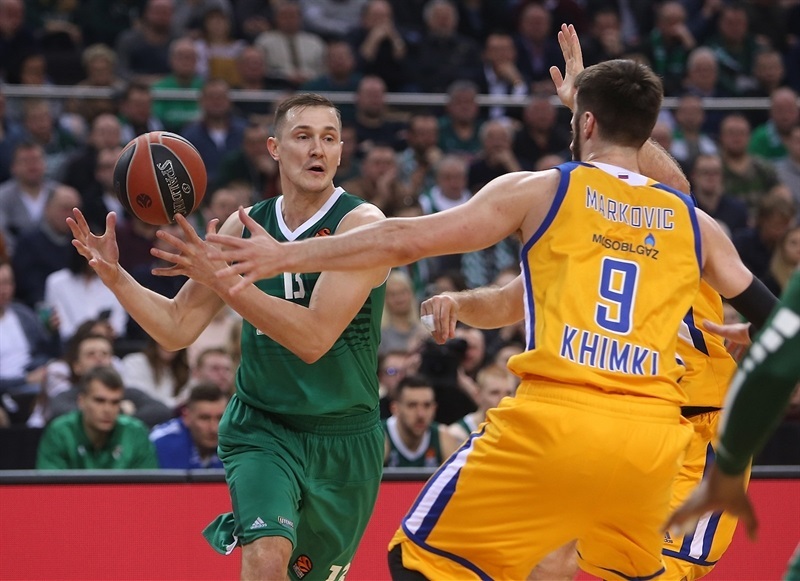 Toupane's triple gave Zalgiris its first lead of the half, but not for long as Gill struck from the corner, and Shved's first points of the half concluded the third quarter's scoring at 59-61. 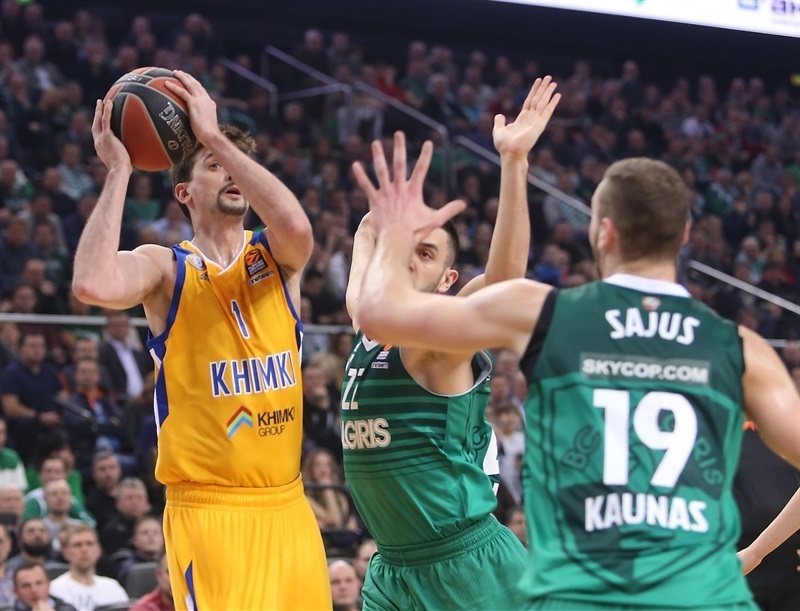 Todorovic found his way to the basket as Khimki's defense continued to stand strong, but White's free throws and Davies's two-pointer restored parity. Todorovic netted again and Gill added a three-pointer, but Davies's three-point play kept Zalgiris close. Another layup-and-one from Davies sent the home team ahead, 69-68 with 4:30 to play. 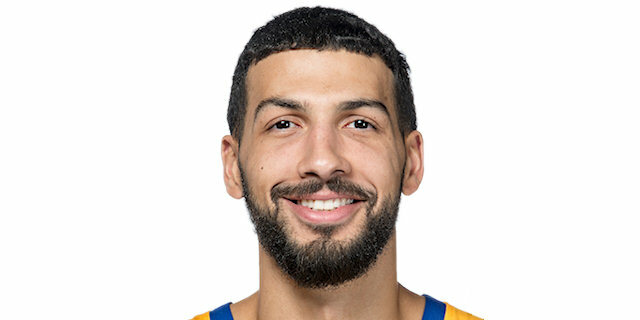 Khimki went back up through free throws, and Honeycutt's layup made it a three-point game as Pangos missed three attempts from downtown. Inside the final minute Honeycutt struck from the corner to make it 73-79 and Gill's free throws sealed the deal before Honeycutt extended the margin of victory with another triple in the dying seconds.